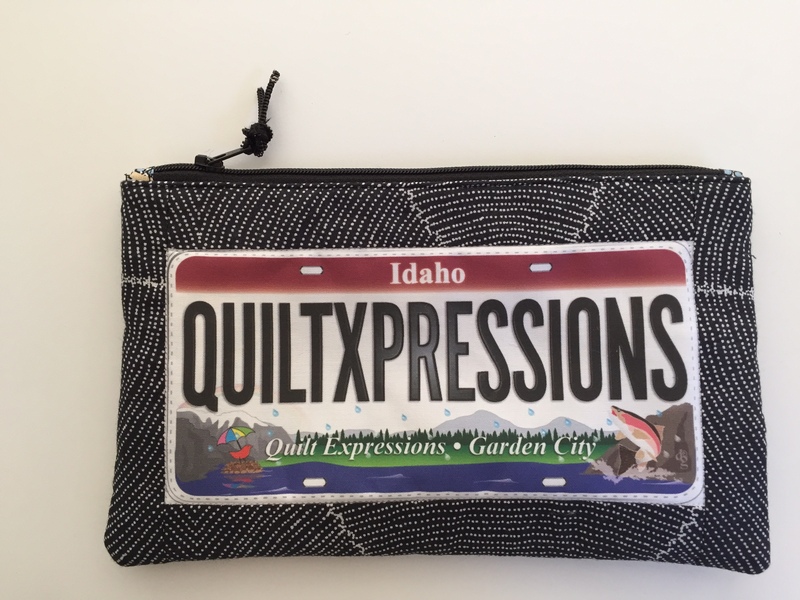 We (the royal “we”) made this zipper pouch using a Row by Row license plate from Quilt Expressions. If you’re collecting plates and wonder what to do with them, here’s an idea for you. From one fat eighth (fabric “A”), cut (1) 10″ x 6″ rectangle, (2) 1 ½” x 7 ¾” strips and (2) 1 ½” x 6″ strips. 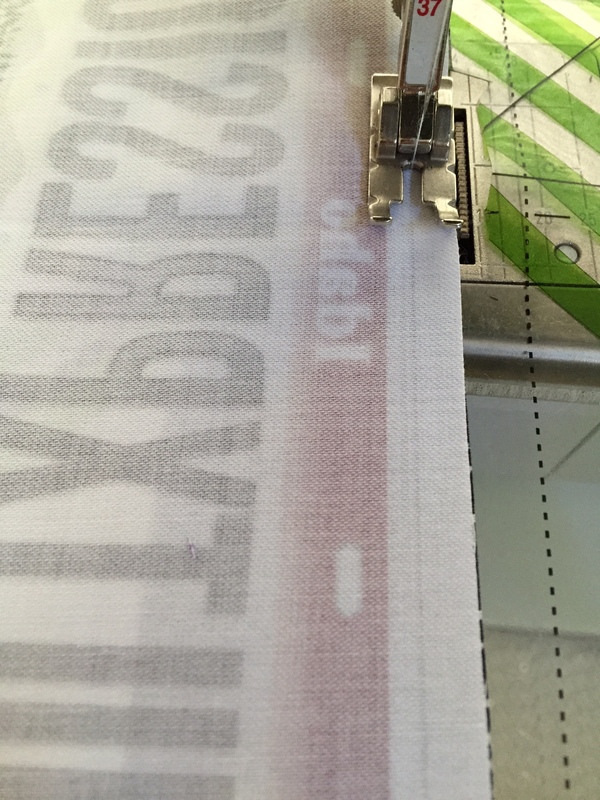 Trim the license plate to 4″ x 7 ¾”. You should have about ¼” around the frame of the license plate on all sides (showing some white fabric). 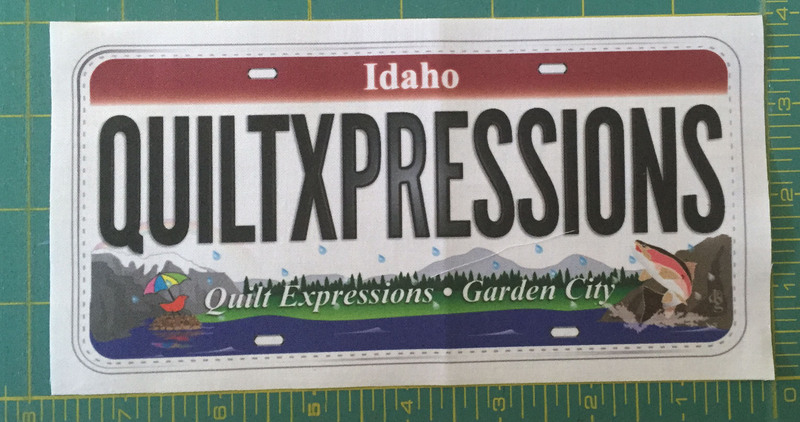 1 ½” x 7 ¾” fabric “A” strip to the top and bottom of the license plate. We used the line around the license plate as a guide. Press seams toward the strip. 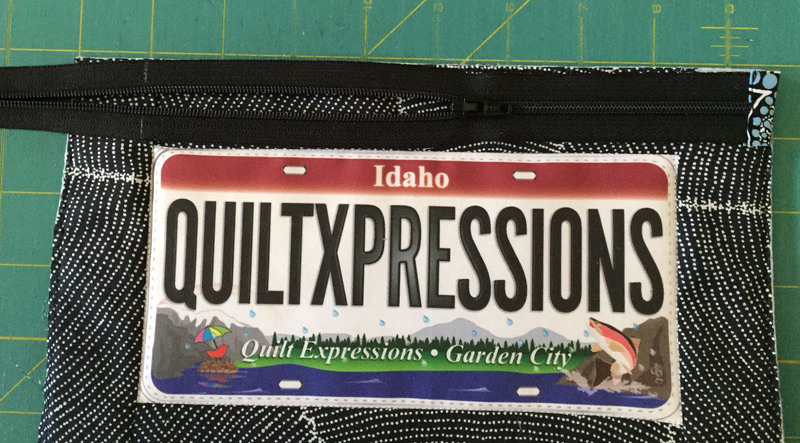 Sew a 1 ½” x 6″ fabric “A” strip to both sides of the license plate. Press seams toward the strip. Fuse the fleece according to the manufacturer’s instructions to the wrong side of one fabric A-10″ x 6″ rectangle and one fabric B-10″ x 6″ rectangle. Lay one rectangle with the fleece side up, then place the license plate rectangle right side up on top of the fleece. 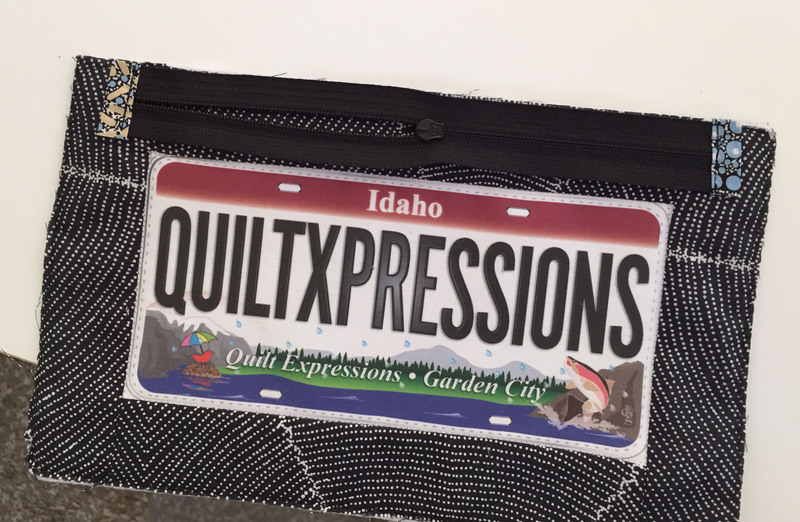 Pin through all layers and stitch in the ditch around the license plate. Trim any excess fleece/fabric to make edges flush. Stitch close to the edge around all four sides with a narrow zigzag or straight stitch. This is the front of your pouch. Place the remaining 10″ x 6″ rectangle on top of the other fleece/fabric rectangle in the same manner. Pin through all layers. You may choose to do some quilting in this rectangle, but it is not necessary. Trim this piece so that it is the same size as the front pouch rectangle. Stitch close to the edge with a narrow zigzag or straight stitch. This is the back of your pouch. Take a scrap of fabric of approximately 1 ½” x 5″ and fold in half along the long edges with wrong sides together. Press. Unfold and bring the outside long edges to the middle crease on both sides and press. Fold in half again and press. 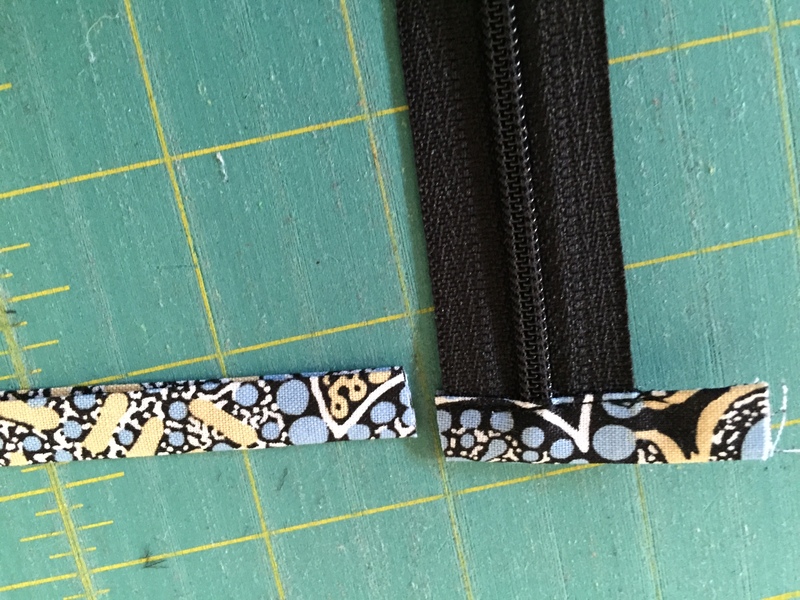 This will be the fabric tabs at both ends of your zipper. 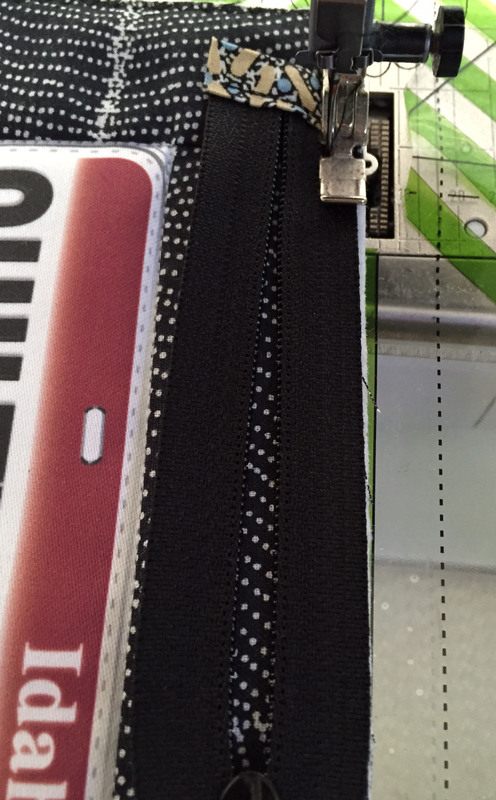 With the zipper closed, cut through the zipper at the staple end (cutting off the staple). Place the zipper inside of the folded tab (towards one end) and top stitch. Make sure you stitch through all layers. 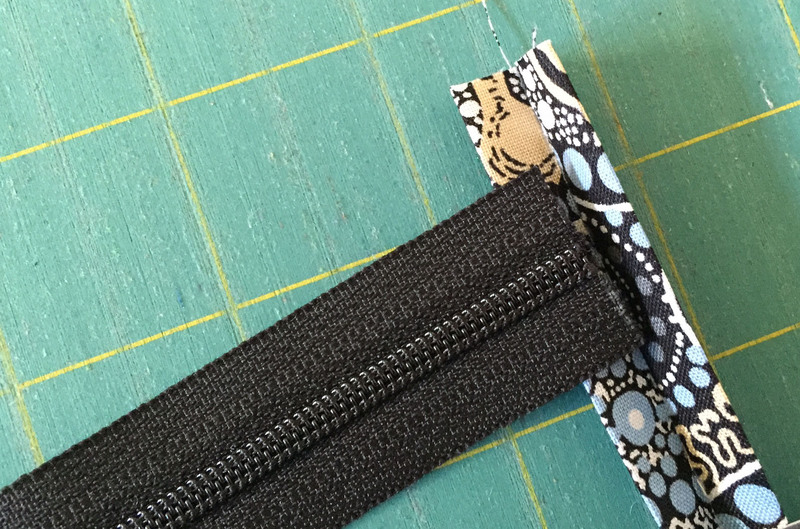 Trim the fabric tab even with the zipper tape on both sides. We’re only showing you one side trimmed here. 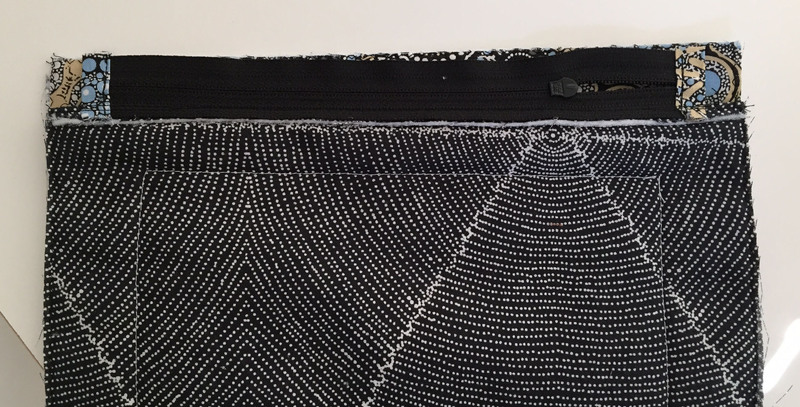 Measure the long side of your pouch; you will trim the zipper 1″ shorter than this measurement. (See the chalk marks below? That’s where we trimmed our zipper.) Unzip the zipper so the pull is near the middle of the zipper; trim your zipper. Place the cut ends inside the folded tab. Top stitch and trim as you did on the other end. 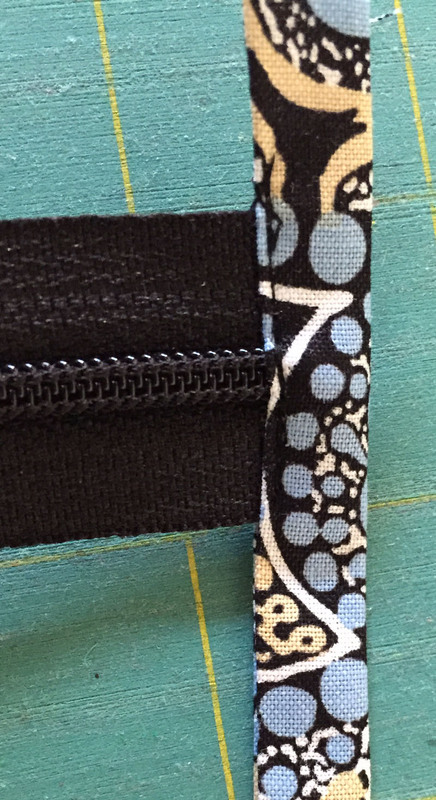 Center the zipper on the top edge of front of your pouch with the pouch front right side up. The zipper pull should be facing down. It’s hard to see–but trust us on this! 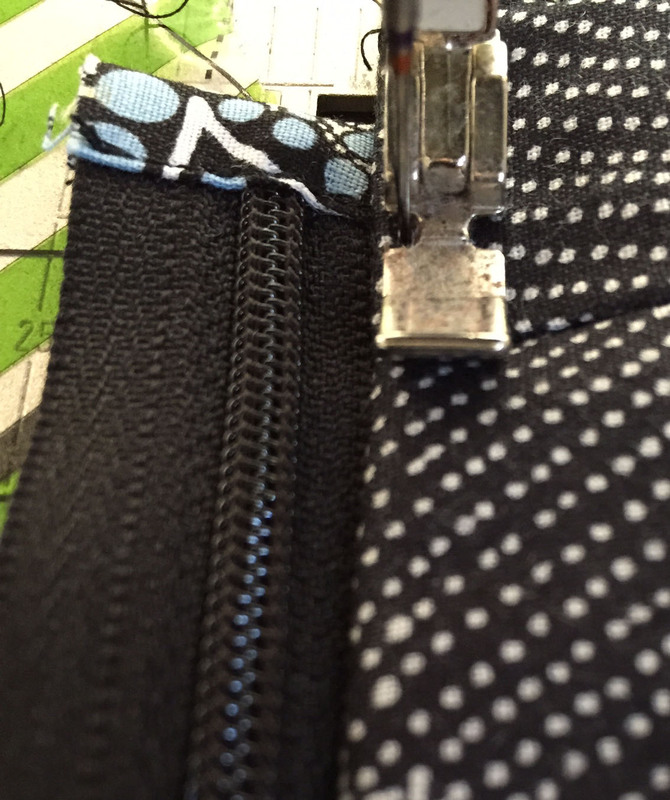 Pin through all layers and stitch along the zipper tape. Fold the zipper back and top stitch close to the fabric edge stitching through all layers. Place the unsewn side of the zipper along the back piece of the pouch and pin in place. Make sure the two pouch pieces line up along the sides. Stitch the zipper along the zipper tape. Fold the zipper back and topstitch close to the fabric edge through all layers. Open up the zipper. Place the pouch pieces with right sides together, matching side and bottom edges and stitch. Turn the pouch through the zipper opening and push out the corners. Enjoy your new pouch! This entry was posted in "Whatcha doin'? ", Della Designs, Tutorials and tagged row by row. Bookmark the permalink. Great idea! I wondered what to do with the 2 that I have already and any that I might buy in the future. When are you going to have a class? ?